Recent globalization trends have increased U.S. inequality by disproportionately raising top incomes. Rising import competition has adversely affected manufacturing employment, led firms to upgrade their production and caused labor earnings to fall. This paper examines the role of globalization in the rapid increase in top incomes. Using a comprehensive data set of thousands of executives at U.S. firms from 1993-2013, we find that exports, along with technology and firm size, have contributed to rising executive compensation. Isolating changes in exports that are unrelated to the executive’s talent and actions, we show that globalization has affected executive pay not only through market channels but also through non-market channels. Furthermore, exogenous export shocks raise executive compensation mostly through bonus payments in poor-governance settings, in line with the hypothesis that globalization has enhanced the executive’s rent capture opportunities. Overall, these results indicate that globalization has played a more central role in the rapid growth of executive compensation and U.S. inequality than previously thought, and that rent capture is an important part of this story. Recent evidence for the US suggests that adjustment costs for those employed in sectors exposed to import competition from China are much higher than previously thought. Trade may have contributed to rising inequality in high income economies…. The World Bank also cites Nobel prize-winning economist Eric Maskin’s view that globalization increases inequality because it increases the mismatch between the skills of different workers. High trade and financial flows between countries, partly enabled by technological advances, are commonly cited as driving income inequality…. In advanced economies, the ability of firms to adopt laborsaving technologies and offshoring has been cited as an important driver of the decline in manufacturing and rising skill premium (Feenstra and Hanson 1996, 1999, 2003) …. Increased financial flows, particularly foreign direct investment (FDI) and portfolio flows have been shown to increase income inequality in both advanced and emerging market economies (Freeman 2010). One potential explanation is the concentration of foreign assets and liabilities in relatively higher skill- and technology-intensive sectors, which pushes up the demand for and wages of higher skilled workers. In addition, FDI could induce skill-specific technological change, be associated with skill-specific wage bargaining, and result in more training for skilled than unskilled workers (Willem te Velde 2003). Moreover, low-skill, outward FDI from advanced economies may in effect be relatively high-skilled, inward FDI in developing economies (Figini and Görg 2011), thus exacerbating the demand for high-skilled workers in recipient countries. Financial deregulation and globalization have also been cited as factors underlying the increase in financial wealth, relative skill intensity, and wages in the finance industry, one of the fastest growing sectors in advanced economies (Phillipon and Reshef 2012; Furceri and Loungani 2013). A trio of recent papers by top officials from the Bank for International Settlements goes further, however, arguing that financial globalisation itself makes booms and busts far more frequent and destabilising than they otherwise would be. Even as globalization has narrowed inequality among countries, it has aggravated income inequality within them. 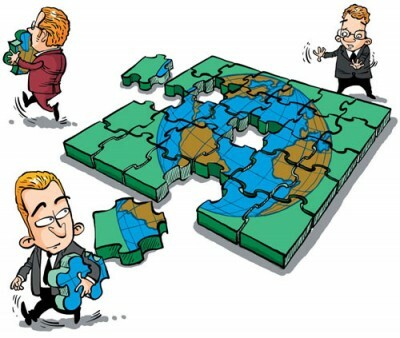 Supporters of economic integration underestimated the risks … that big slices of society would feel left behind ….